The University of Michigan Health System (UMHS) is a premier, quaternary care center that is among the top 10 academic medical centers in the United States. As a highly ranked academic medical center and award-winning healthcare system, its physicians are leaders in advanced research, education, and patient care. In line with its vision to create the future of healthcare through discovery, innovation, and education, the medical school is one of the leading recipients of funding from the National Institutes of Health. The results from the NLST and the USPSTF recommendations will eventually transform the landscape of lung screening in the U.S., driving up the number of patients undergoing a CT-lung screening exam. This spike in patient volumes places growing pressures on radiologists in particular to work more efficiently to screen more patients. “With approximately 7 to 10 million individuals in the U.S. projected to meet the criteria for lung cancer screening, thoracic CT volumes will undoubtedly increase with both the screening CT exams and interval CTs between screening for moderately suspicious nodules,” said Dr. Kazerooni. The influx of lung screening patients will drive the need for advanced visualization tools that increase efficiency, are fast and easy to use, and are widely accessible. Efficiency combined with accuracy is mission critical for CT-lung screening, and Dr. Kazerooni leverages the tools available on Vitrea software. “The lung application from Vital Images available on Vitrea is a critical tool for radiologists to evaluate thoracic/chest CT studies for lung cancer or to track its progression. This specialized 3D application provides semi-automated segmentation and quantification of lung nodules and can track changes across multiple time points. The application also provides segmentation and visualization of the airways for identifying tracheal stenosis or tracheomalacia,” noted Dr. Kazerooni. The specific functions of Vitrea tools enable reading and comparison of one or many CT-lung studies simultaneously; automated segmentation of the lungs and airways; a one-click nodule probe tool for auto-measurement of nodules, volume measurements, lung emphysema visualization preset, airway evaluation, nodule size growth, and doubling times; and an auto-populate report summarizing nodule findings and measurements. Keeping pace with the fast growing demands on report turnaround times and capabilities that support collaboration in real-time are critical to efficient workflow. 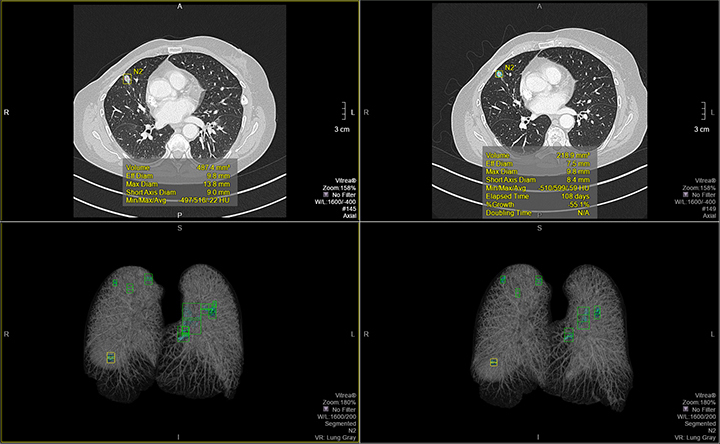 “VitreaAdvanced — CT Lung probes and measures nodules and provides reporting features. More specifically, you can include in the radiology reports nodule size on current studies or over time on serial exams, and even images. VitreaAdvanced helps radiologists work through exams efficiently and accurately,” she added. There could be greater emphasis on using clinical decision-support tools that enable all radiologists, from generalists to specialists, to evaluate lung CT with the same level of quality and confidence. One such tool is computer-aided diagnosis (CAD), which gives all radiologists an edge in accuracy. “CAD has the potential to even out the performance of radiologists across practices, from the general radiologist to the specialized thoracic radiologist. The results of the NLST were found with thoracic radiologists as readers; yet, it is important that all radiologists who may be interpreting these exams can do so with quality performance standards,” she said. To meet this need, Vitrea offers Mevis Visia CT Lung CAD at the workstation and provides Web-based access to this CAD solution. “A potential benefit of CAD is to aid in lung-nodule detection. Another benefit is nodule characterization with respect to tissue components — solid, ground glass or mixed nodules, calcium, and fat — and nodule borders, which are important in making management recommendations based on the probability of malignancy,” said Dr. Kazerooni. Based on the USPSTF recommendations, individuals may undergo CT screening exams annually for up to 25 years. In light of concerns for radiation exposure from CT exams, recent advances in dose reduction technology will facilitate the adoption of CT-lung screening. Dr. Kazerooni acknowledges there are lingering concerns about radiation exposure for patients undergoing annual CT lung-screening exams in addition to other diagnostic CT exams, such as PET/CT to evaluate positive screens. However, advances in dose techniques, such as MBIR (model-based iterative reconstruction) and ADIR (adaptive-iterative dose reduction), permit significant reductions in radiation exposure while maintaining high-quality lung-CT imaging. In addition, the target population for LDCT lung cancer screening is older individuals for whom the risks of any radiation-related cancer are far less than childern and young adults. As the practice of CT-lung screening becomes more prevalent, successful lung screening programs like the one at UMHS require careful protocols for screening appropriate individuals, and for interpreting, reporting, and managing the abnormalities found correctly and appropriately, working with primary care practitioners who are at the front lines with patients. Multidiscplinary collaboration across radiology, pulmonary medicine, and thoracic surgery is important for the management of the small percentage of patients with CT abnormalities that are the most suspicious for lung cancer. “Given the huge population that we expect to come forward for screening in the future, any tools that can help radiologists be more efficient and perform at a consistently high standard are key to a successful lung-cancer screening program,” said Dr. Kazerooni. Berg CD, Black WC, Clapp JD, et al. Reduced Lung-Cancer Mortality with Low-Dose Computed Tomographic Screening. N Engl J Med. 2011 Aug 4;365(5):395-409. doi: 10.1056/NEJMoa1102873. Epub 2011 Jun 29. Screening for Lung Cancer. U.S. Preventive Services Task Force. http://www.uspreventiveservicestaskforce.org/uspstf/uspslung.htm. Updated January 2014. Accessed March 10, 2014. 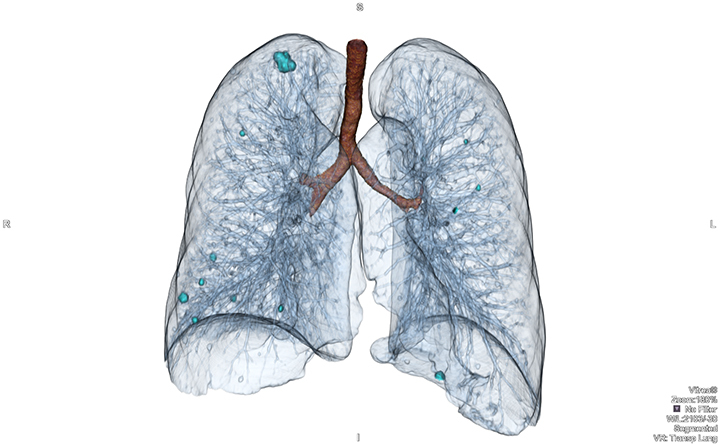 CT-Lung Screening Drives the Need for Advanced Visualization Tools. Appl Radiol.